We paid a visit to Jennifer Lawrence Bennett’s studio, home to her jewelry line Di Luce Design. 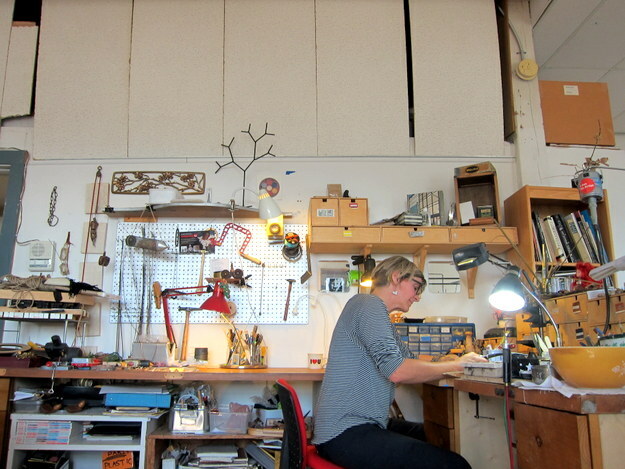 Nestled between Seattle’s Little Saigon and the Central District, Jennifer told us how unique it is to be making jewelry that can be purchased (literally!) down the street at KOBO at Higo. Take a look around her space and read more about Di Luce Design below. I want to make things that people connect with, that wear well, and are affordable to a larger audience. Your jewelry is quite diverse in design. Can you tell us a little more? 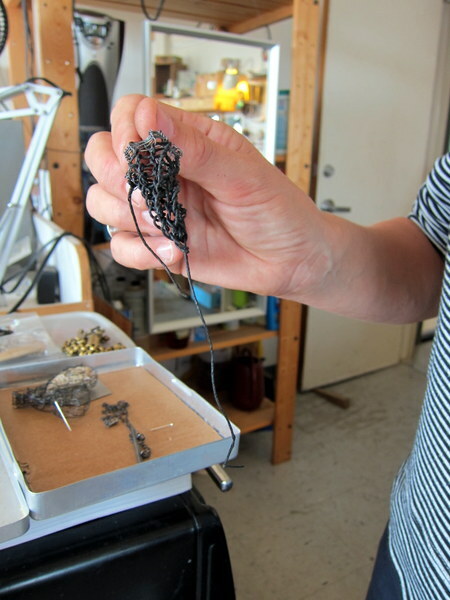 I would say I have several threads in my work: the wire-based pieces are influenced by my interest in textiles (things being knitted together figuratively and literally), sculpture, and my maternal grandmother. She is the one who taught me my basic knitting and sewing skills. 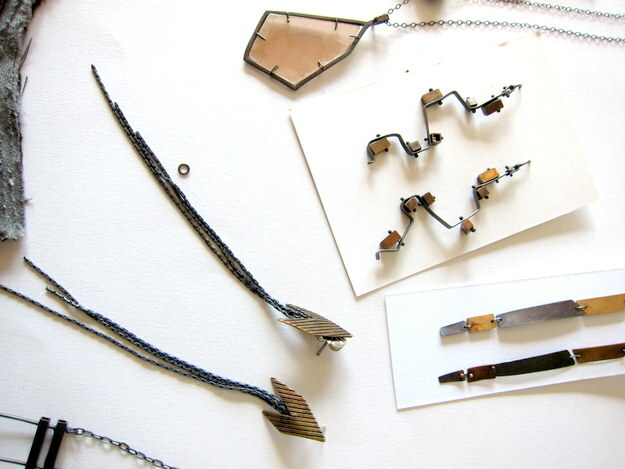 The mica [see hexagonal shapes in necklace, layered material in collar above] is my own exploration….I came across it as a child behind my house in Idaho and continue to be fascinated with it, even though it has been challenging to work with. It just speaks volumes about light, reflection, and transparency; words that have their face-value meaning but also resonate on a deeper level. 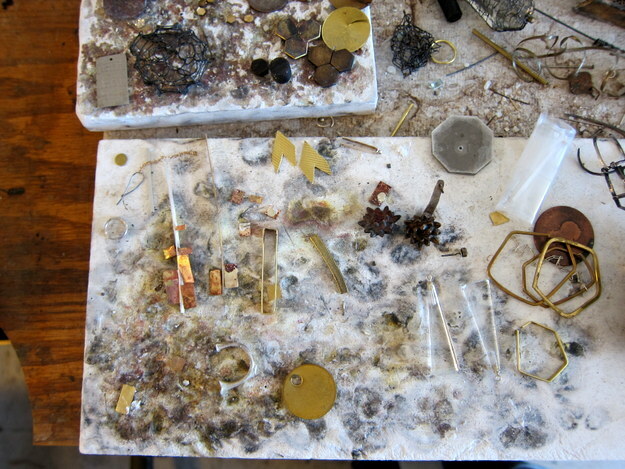 The silver and brass work comes from enjoying playing with patina and using material that is more affordable. 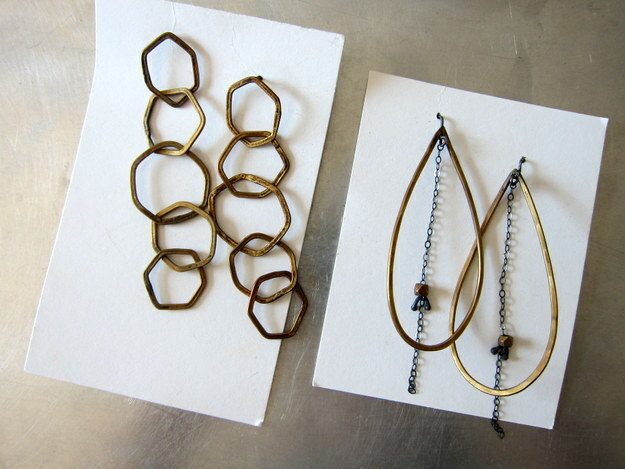 I like the “black and yellow” and also have been influenced by Calder’s brass jewelry, even though I don’t think my work resembles it. I go back and look at his work frequently and am never disappointed. What would you like others to understand about your work? That is hard to articulate. I think I mainly want it to feel accessible; and, to feel a sense of connectivity to it being hand-made with thoughtfulness. Jewelry is art on the body–it is personal beyond a painting. When you wear it, you connect to the maker on different level. Find Di Luce Designs at both our locations – KOBO at Higo and KOBO Capitol Hill.